At Bidawee farm we take pride in our reputation and rely on good references from our clients as our best advertising. Here is a sample of how some of them feel. 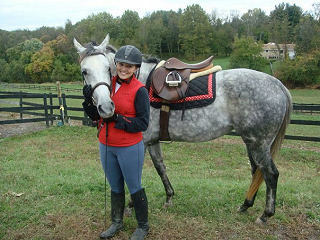 Speedy is an OTTB that happily found a new home with Sharon Dors-Miller! 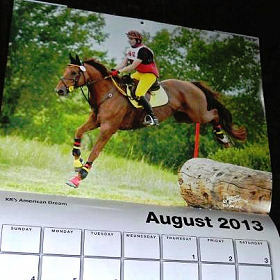 So excited… and happy when our horses find super second careers! If anyone is looking for a new horse, I highly recommend Sharon, she does a fabulous job with young stock and I’m tickled to see Speedy looking so happy! I cannot thank Sharon enough for the wonderful job she did training my two babies! 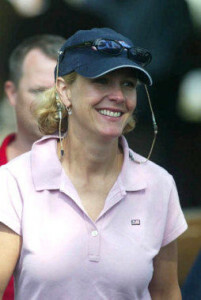 When it came time to get my three-year-olds under saddle for the first time, I asked a lot of people for their opinions, and the same name came up – Sharon Dors-Miller. I have known her for years, and she has an excellent well deserved reputation for training babies and OTTBs with a system that is fair, kind and produces amazing results. I now have two babies that can do it all and are quiet, brave and very well behaved, both on the ground and in the tack, and are a joy to be around.Not only did Sharon train my horses, but before they went home, I took several lessons on each horse to make sure I was comfortable riding my greenies and would be able to continue the training Sharon had already put in place. Her teaching not only includes the “how”, but the “why” things are done. By understanding the whole process and understanding how my baby horse in thinking, I am better equipped to handle the little things that pop up in training on a day to day basis. If you are in the market for a trainer to help you with a young or untrained horse, Sharon Dors-Miller is the only one you should even think of using – She’s the BEST. Katie and I just love “AL” (Bentley). We now have his show name as “K.R.’s American Dream”. He truly is Katie’s dream horse. For a young warm blood, he is very gentle, willing, brave and a very fast learner. Katie just finished the Abbe Ranch Horse Trials and she was the top junior in the novice division. Bentley gave Katie her best dressage score ever. At every show or schooling that we attend, Bentley gets compliments. We absolutely love him! Thank you again so much for all you’ve done for my horse. I’m so very proud of him anyway, but even more so now that I’ve experienced his potential. Thanks so much for putting forth such professional effort and making him mine to keep. 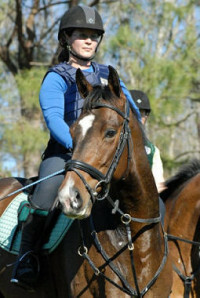 Sharon Miller helped me buy two young off the track TB’s and both have turned out to be fantastic eventing prospects. Sharon’s eye for conformation and movement is invaulable and I could not be happier with the horses she picked out for me. I want to continue working with young TB’s and I will always use Sharon as my source. I was very impressed by Sharon’s honest evaluation and presentation of this guy. She spent a lot of time and effort making sure he was represented honestly and accurately…not too many people take the time to do that anymore! I just wanted to tell you Casino and Tango are doing great. Tango won two training level events this season and Casino was 2nd and 3rd in her two novice events. I’ve attached pictures from camp with Philip Dutton this summer as well as a few earlier ones. I can never thank you enough for such wonderful horses. I can’t wait to see what you find for me next. 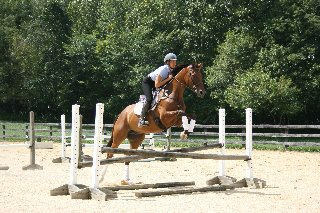 I have great confidence in the young horses you find and the wonderful start you give them. They are so well grounded in their flatwork, confident on the trail with a good start over fences. They are easy to be around with excellent ground manners. Perhaps most importantly, they are happy. Due to a difficult illness I was unable to ride and compete. When I returned to riding again, Sharon was a great resource in helping me and my horse Belle get fit, safe and ready to return to eventing. She invested her time and effort into improving Belle’s jump-ability and in fixing my jumping faults and in the process really improving my confidence. Belle and I are now a happy perfect team! When I bought my 17 hand 4 yr old TB/Paint cross (Gunny), my goal was to make him my next star horse for fox hunting and competing. I soon realized the project was way more than I could handle and that I was going to need a lot of help. Fortunately, I met Sharon. It must have been fate because I’m certain that most people would have insisted that I sell him for a more suitable horse; (in fact Sharon even suggested it a time or two) however, I was determined to give it a try and Sharon was willing to go the extra miles to help me. And believe me, it was a lot of miles. Sharon not only had the challenge of making Gunny a suitable horse, she also had to make me a capable rider. She spent hours schooling Gunny and just as many hours giving me lessons to correct years of bad habits which resulted in poor equitation. I could probably write a book about all that we went through over the past two years but I’ll just get to the point. Her diligence, persistence, expertise, support, determination, and excellence helped me turn my horse into the star that I wanted him to be. 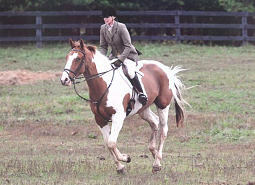 I’m in my second season of fox hunting and Gunny is turning out to be the perfect horse for me. To Sharon I express my sincere thanks and gratitude for all that she has done for Gunny and me! Sharon, I just LOVE my pony! Northern Lytes, aka “Lady” is all that you represented and more. She is a kind, gentle companion on the ground and a most willing partner under saddle; quick to learn and always wanting to please. Lady loves everyone and everyone loves her. Thanks for helping us find each other. Sharon, I LOVE TESSA, she is the best thing that has ever happened to me! Sharon has spent many years fostering and developing strong professional relationships with the Owners, Trainers and Exercise riders at Penn National Race Track. I personally have been doing business with Sharon for the last 6 yrs and in that time seen her ability to access and evaluate prospects at the track for many different disciplines despite the less than prefect conditions that horse’s are sometimes presented in. She truly has a gift to seek the diamond in the rough and find its fullest potential. Sharon has also impressed me with her personal mission to give back to the animals that give us so much! It is this aspect of Sharon’s character that has allowed me to see that not only are her talents with horses exceptional, but that she also operates a business with great integrity! 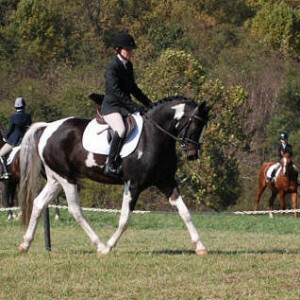 Sharon is about quality… as an individual and in horses!!!! I have known Sharon for years and have used Sharon’s services for both training and instruction. As a trainer, Sharon truly “speaks horse”! 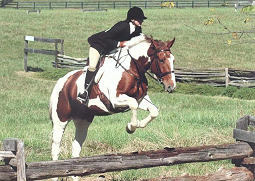 She is in tune to a horse’s physical ability and mental capacity, and can bring any horse up to his potential. 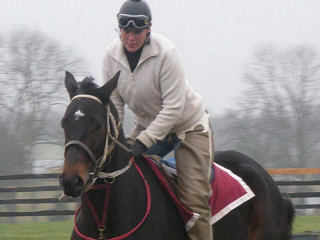 She backed a draft cross filly named Katie for me a few years ago. 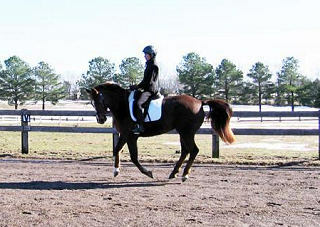 The draft cross had not been handled much before it got to Sharon, but within 30 days, Sharon had her on voice commands on the lounge line and walk, trot, canter under saddle in the ring. More than once, my thoroughbred has gone to “Bid-A-Wee Boot Camp” to prepare him for competition and to get him going again in the spring. As an instructor, Sharon is patient with her students. She’s dealt calmly for years with my confidence issues, but never stopped from pushing me to go further and do more. She continually challenged me and helped bring me to my potential. Most importantly I think, is that she focused on preparing me and my horse for success. While we were competing, she ensured that there was no question that I didn’t first see and overcome with her in a relaxed lesson environment, so that we worked through any issues before we got to competition. I highly recommend Sharon’s services as both an instructor and a trainer. She brings out the best in both horse and rider! I had been out of riding and without a horse for about 4 years when my friend and I started looking for our newest equine friends. I decided I wanted a rescue horse. My friend told me about Sharon Miller and Bidawee Farm so I went to Sharon’s website and couldn’t believe my eyes when I saw “Mr. T.” We went to see him and he was exactly as Sharon represented, friendly, willing and happy to do his job. 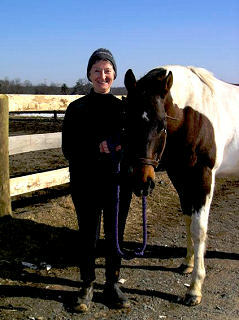 Mr. T and I got along very well and I enjoyed being at Sharon’s tidy barn and seeing all her well cared for horses. Sharon rode Mr. T for me and then I got on him. Again he was just like she said he was, friendly, dependable and willing. Once I decided he was the one, she gave me a couple of lessons in her excellent ring and helped me understand what he needed and how we could each do our best. Sharon took wonderful care of Mr. T while I was finding a place for him to stay near me and had him all ready to get on the trailer to come live with me when the time came. Also if I have any questions or need to find a place to board him for a while, I know I can depend on Sharon. Mr. T. and I love going on trail rides with our new friends. I have very much enjoyed getting to know the people around the barn where Mr. T now lives and it is so much fun sharing stories about with them about how our “guys” are doing out in their big pasture. 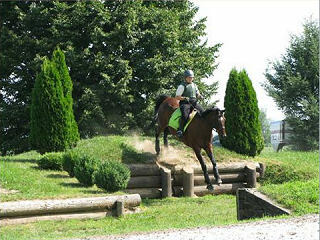 Each time I go out on the trail with Mr. T or ride with our friends in the ring, I can’t believe how lucky I am. Sharon really cares about the horses she works with and does a very accurate job of evaluating them for their prospective owners. I also was very pleased to have dealings with a completely honest and caring horse professional. If you are looking for your next best equine friend, check out Sharon and Bidawee Farm. You better be serious! If the right critter isn’t there, she’ll find you one! 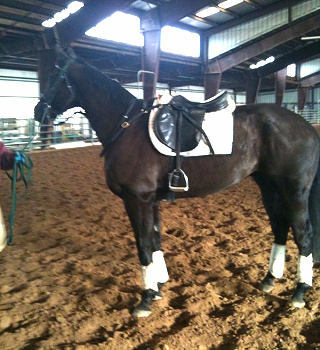 I was looking for a trainer to send one of our rescue horses to for a couple of months to get restarted under tack and explore the possibilities of him bieng adopted out. It is very hard to find a professional who wants to work with a rescue, these horses come with a lot fo unknowns and baggage from surviving their ordeals. 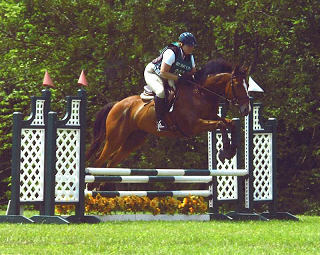 Sharon came highly recommended to me by another professional and she got him going under saddle in the ring, but also took the time to ride him out with the Warrenton Hunt Club on a couple of trail rides, truely exposing him to chaos and real life situations. Sharon then networked and found him a perfect home for life!! I would highly recommend Sharon for any of your training needs, she has a wondeful combination of knowledge and compassion, and we at the Qeuine Rescue Society and Deermeadow Farms are very grateful for what she did for Troy!!! 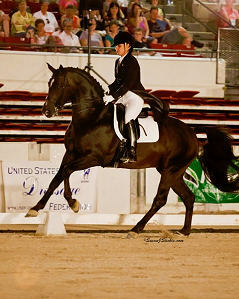 Sharon has spent many years honing her talent as a horsewoman and she is one in every sense of the word. What makes Sharon exceptional, though, is not only her ability but also her willingness to share her skills and knowledge with others. I have taken lessons from many professionals in my years of riding and Sharon is among the best instructors I have had the privilege to ride with. She is able to both communicate what the student needs to do and to deliver that message in a variety of ways so that the student can accomplish what she is asking. 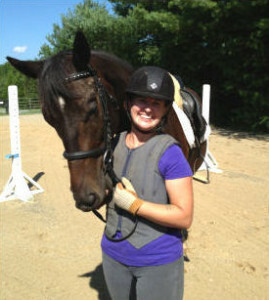 Best of all, Sharon provides her students with the information necessary to be better rider, even when she is not in the ring. Sharon is also an excellent caregiver for the horse’s in her barn and leaves no stone unturned when seeking information on how best to keep and maintain them. When she makes a recommendation to me, I know that it is one that I can trust. Over the years I have changed feeds and supplements for my horses based on Sharon’s recommendations and I have never been disappointed with the results. Sharon Miller is a horsewoman I trust!